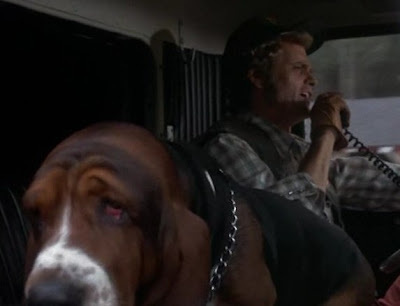 When I was 15 yrs old, I got a basset hound puppy who I named "Fred" after the basset in the legendary movie, Smokey and the Bandit. Many years later, Fred was living on our 11-acre mini-farm in Southwest Georgia. My Mom came out to the house Christmas Eve and had brought several items to include in the dinner spread. When she arrived at the house, she came in, sat down and visited for a while. After 30 or 45 minutes, she suddenly said, "Oh, I almost forgot, I need to get the food out of the car!" I jumped up, put my boots on, and went out to help her carry in the food. Walking out the back door, I quickly realized that she had left her car door open when she came into the house. I instantly thought about how long the door had been open and wondered if her car battery might have died sitting there with the dome light on that long. Then, like a light bulb flicking on in my head, I had a sinking feeling in my stomach as I started thinking about the food and the fact the Fred was out in the yard and had a very good nose. When I got to her car I noticed the Saran wrap on the bowl of Potato Salad had a hole in it and there was a large divot in the Potato Salad. I then noticed that there was this very delicious looking Red Velvet Cake with cream cheese icing sitting on the seat with no cover. On closer inspection, I noticed a big gap in the icing where Fred had gotten several licks of icing. Fred ended up having a much better Christmas Eve dinner than originally planned and the rest of us had a little different dinner than we had planned. Reminds me of our Whiskey (RIP), a German Shepherd that weighed in at 125 lbs. He could easily put his paws on the kitchen counter and help himself to anything I had up there. Thankfully, he was a very well behaved gentledog and minded his manners... most of the time! lol! Nope, I definately did not punish the dog. He didn't leave the door open. And plus, it was Christmas. He just wanted his holiday dinner! Yeah, he basset definately had low reach with his short legs. So, it was very rare that food was ever in his reach, so he HAD to capitalize on any opportunity. Thanks for reading and writing, Y'all! In the movie Fred added such a funny highlight. So what started you thinking about your Fred?